We continue our week-long tribute to the video game robots that we love with a Star Wars droid that loves you too, meatbag. Original characters created for video games set in the Star Wars universe rarely earn the sort of love we hold for HK-47, the homicidal droid who rose to fame in BioWare's Star Wars: Knights of the Old Republic. 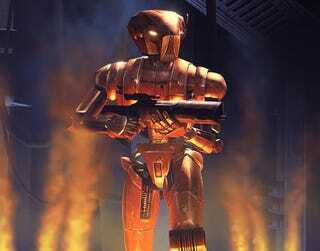 HK-47 went on to appear in that game's sequel, also earning an appearance in the Trials of Obi-Wan expansion for Sony Online Entertainment's massively multiplayer online game, Star Wars Galaxies. We're keeping our fingers crossed for an appearance in BioWare's Star Wars: The Old Republic MMO as well. And while it may seem that HK-47 actually hates us, he does love to hate us, so it only stands to reason we should love him right back.